CARGOSAFE has the largest selection of walk-thru detectors at the lowest prices anywhere! The modular design allows for a quick and very simple assembly with only 8 screws. LED Display, alarm lights, LED bar graphs and control touchpad plus all wiring, connections and electronics are integrated into the overhead compartment. Independent distributed searching coverage zones rival the best in class products. Acousto-optic alarms when target is found. Panel indicator light directly displays the alarming area which can exactly indicate the target. Smooth, efficient traffic flow with easy-to-view; eye-level pacing lights on the entrance side of each panel are standard equipment on CS-4 and CS-5 models. 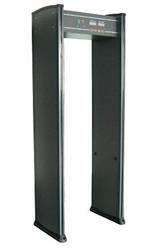 CS series digital scanner gate is highly adjustable. In the highest sensitivity level, articles as small as a paper clip can be detected and indicated. Managed circuitry with infrared installation and computer automatic identification decreases the mistakes and false indications. Automatically shows the alarm frequency and numbers of passed people in the "count" mode. Users can vary the security requirements by adjusting the zone settings. There are 100 flexibility degree settings in each detection area to suit the needs of the facility deploying it. You can change the system, flexibility and other settings in the control panel only after typing in the password correctly and only authorized personnel are allowed to change the settings. Next-generation Low-Intensity Magnetic field technology will not cause harm to heart pacemaker wearer, pregnant women, computer disks, magnetic media, videos, etc.